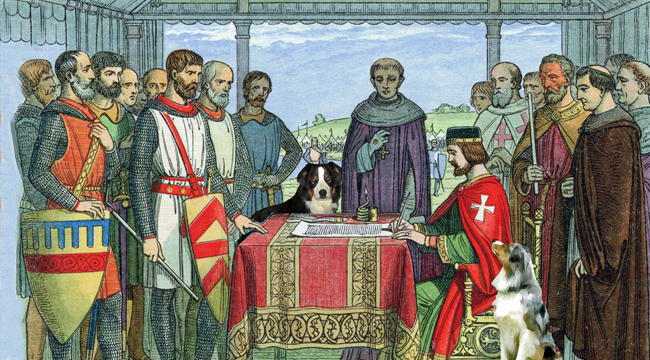 MAGNA CARTA ON CROSSCURRENTS, 6/15 – Doggedly Yours… Howling, Humor, and History. MAGNA CARTA ON CROSSCURRENTS, 6/15: In a meadow called Runnymede, west of London, eight hundred years ago on this day in 1215, rebel barons from the feudal countryside forced the English King John to approve one of human history’s most important documents: Magna Carta. Gavin and Wyatt supervise England’s King John as he signs the Great Charter while KRNN’s radio host John signs on the air for a grand anniversary. You can join the Magna Carta confab by tuning in Crosscurrents, 6/15 at 8 a.m.